The [Controller Channels Map] function found in the Applications Screen rapidly scans through all possible Measuring Block groups or Adaptation Channels on any controller and writes a "map" file. For modules using UDS, a modern HEX-NET or HEX-V2 interface is required to make channel maps of Measuring Values (the supporting ROD file for the module must be present as well). Choose the Controller Address (such as 01 for Engine), then any Login or security access code (not needed in most cases, contact Ross-Tech for assistance), then select either Measuring Values or Adaptations or both. 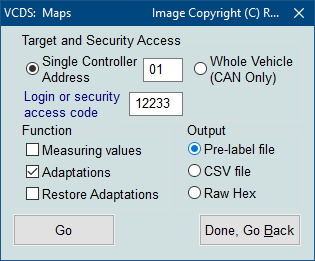 Output is your choice of .CSV or .PLB ("Prototype Label, Blocks"), which is useful for creating new label files or taking a "snapshot" of all available data from an ECU. Click [Go] to begin the process, the results will automatically be saved to your C:\Ross-Tech\VCDS\Logs directory. Use [Done, Go Back] to return to the Applications screen.